Green-Wood has invited artist Aaron Asis to develop a series of experiential interventions designed to highlight the perception and significance of being “unseen” in Green-Wood. Over the next nine months, Asis will work to accentuate lesser appreciated elements of the cemetery’s physical environments, and to celebrate them as places of both memorialization and of public congregation. 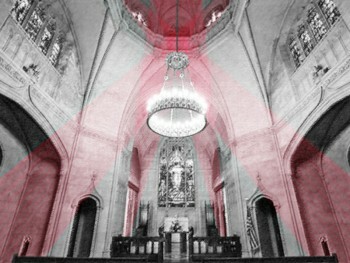 unSeen Green will kick-off with a two week site-specific installation in Green-Wood’s Chapel – one of our most visible landmarks – and feature two musical encore events by percussionists Owen Weaver and Dennis Sullivan performing Tristan Perich’s large-scale work Impermanent for tubular bells and two-channel 1-bit electronics. Formal seating will be limited. Visitors will be encouraged to use provided seating mats for floor seating. The main gates of the cemetery will open at 7:15pm and close at 7:45pm.